The perfect recipe for Spring or anytime of the year that you desire a light and fresh salad. 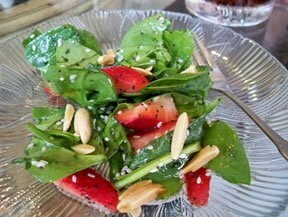 With sweet strawberries and fresh spinach leaves you will find yourself serving this salad all year round. Learn the proper way to clean strawberries to ensure that they are in the best condition for your recipes. Discover how easy it is to freeze rhubarb. Learn several freezing methods that will provide you with rhubarb to enjoy all year round.